S P O I L E R S for non-US viewers! The Season 3 finale is a curious beast. It's a mixture of tragedy, as the marriage of Don and Betty disintegrates, and optimistic 'let's put on a show' camaraderie as the survivors of Sterling Cooper's sale to McCann Erickson get together to rescue their careers. So, shut the door. Take a seat. Don ends up being shot from all sides during the last episode and for the most part, especially in the way he's cheated on Betty, he pretty much deserves it. 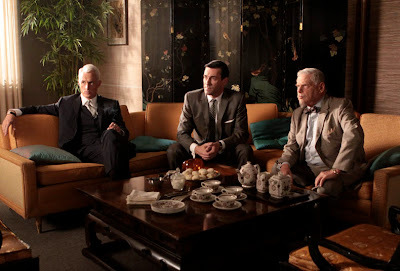 But his status at Sterling Cooper took a huge knock when Hilton forced him to sign a contract. 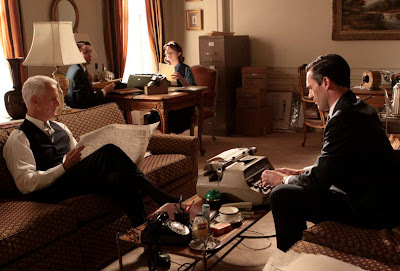 Now, as Sterling Cooper implodes, in one way he's a free man because Betty demands a divorce whether he likes it or not and in another he's still chained, along with Roger and Bert, to McCann Erickson. Two marriages he'd rather not be a part of. He also has to eat a great big slice of humble pie on two fronts - one with Peggy and one with Pete Campbell both of whom take him down several pegs for simply trampling all over their ambitions. With Peggy he literally has to beg to get her to come to work with him at the new agency that he, Roger, Bert and Lane decide to set up. It's interesting that he also emphasises the fact that America has become so unsure of itself post-Kennedy and he sees Peggy as one way of acknowledging that in the agency. Either that or it was complete flattery. With Pete he has to be made to acknowledge that Campbell is the voice of progress and youth that the agency really needs. Again, you did get the sense, as you always do with Don, that he's just saying the things that people want to hear, to enable him to get them to do things for him. Much as we love to hate him, and his treatment of Betty after Roger lets slip about her friendship with Henry Francis is despicable, you simply have to feel for the man as he and Betty sit the kids down and try to explain that the family is breaking up. He clearly loves his children as was vividly displayed in that moment where he clings on to little Bobby and where he snuggles up to a sleeping Sally. It's also symbolic of the dying embers of the 1950s snuffed out by the post-Kennedy insecurity. 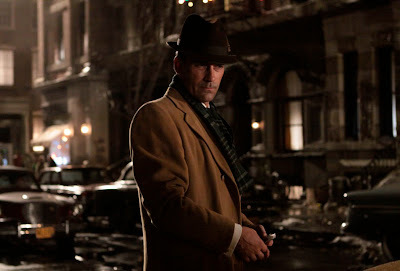 What isn't clear is exactly what the heck Matthew Weiner is doing to the series itself. 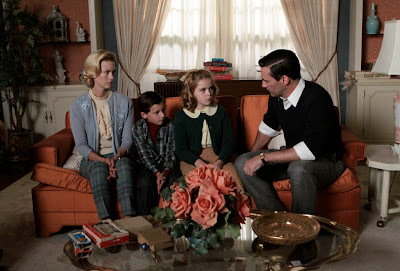 Yes, the Don and Betty story really did have to reach crisis and the show must follow that fall out but the whole 're-set' of the series setting, as corny and fake as the change from Sterling Cooper to Sterling Cooper Draper Pryce, leaves the audience feeling they've been manipulated. So, the only reason that Joan actually left then is so she can come back to organise these desperate creatives? Much as I love Joan, it was horribly obvious she would saunter through the doors as soon as Roger said he needed to make a phone call because they couldn't cope with a bit of filing. And were they likely to dump major characters like Peggy and Pete? No. And we'll really know if the show has had a fit of leaping aquatic predators when early next season Don calls in Sal Romano to sort out the Art Department at the new agency. All the pieces will have been shuffled and rather clumsily dropped back into the very same place. And will we ever see the likes of Smitty, Ken and Lois again? Probably. Just as we are likely to follow the Betty and Henry story because Mad Men without January Jones doesn't bear thinking about. But I'll need some convincing that this wasn't an excuse to design a new office set and that Weiner is going to use the stripped down version of Sterling Cooper to really get to grips with the 1960s. Better still I'd like to see the series really expand beyond the office walls and explore other characters and narratives: let's see Sal's journey through the gay subculture of the '60s, let's follow Doctor Greg to Vietnam because I'm not sure a sub-plot about Betty and Henry post-flight to Reno is going to cut the mustard and I have a horrible feeling that mid-way through next season there'll be a Don and Betty reconciliation. An interesting season finale, very enjoyable, but it's plotting feels as fake and as contrived as the advertising featured in the series and Weiner hasn't sold it to me yet. Season Four will either echo Don's line to the stewardess at the start of this year's premiere, "I keep going to a lot of places and ending up somewhere I've already been" or it'll fulfill the hope of Roy Orbison's "Shahdaroba" playing over the end scene of Don walking to his new apartment where "The future is much better than the past."